1. Exclusive Use of the Conservatory (normally £790 to hire weekends, £592.50 weekdays) - but free for former Brides who have married at the Castle and for 'Castle Members'. 2. You can book any available weekday Sunday to Thursday within the next 12 months - see 2018 availability here. Not available at weekends except for very short notice dates by special negotiation. 3. Choice of a two course late Luncheon - select two courses from our Standard Wedding Breakfast. Or book a Buffet for an Evening Anniversary Party - see our Evening Buffet choices. 4. Late Bar for guests / residents with an option for your guests to use either the main Patti Bar (non-exclusive use), or we can stock up and staff your own personal Bar (exclusive use) within the Conservatory itself (guests pay for their own drinks at the bar). 5. Projector and Screen for streaming photographs and videos straight from your laptop - so you can even screen a selection of your Wedding Photographs or any memorable family Videos/ DVDs at your Party. 6. Option to swap the Luncheon or Evening Buffet above for our Afternoon Teas Package - with a stunning selection of sandwiches and cakes. Our Afternoon Teas are served on fancy three tier cake stands (one per guest) and include a pot of tea of your choice, two glasses of pimms and a generous selection of delicate cut sandwiches and mouthwatering cakes, scones and cream and luxury bites and nibbles. 7. Option to upgrade with our DJ Package - Pure Dj. 3. 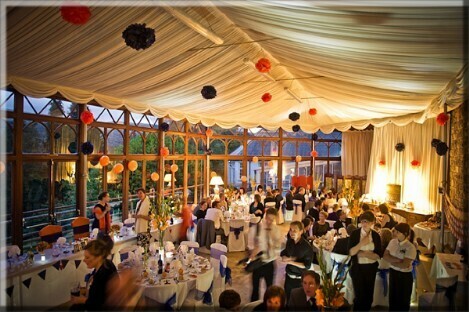 Weekday Venue Hire for the Conservatory is £592.50 and Weekend hire is £790 - however this is waived for (a) Brides & Grooms who have married at the Castle and also for (b) Members of the Craig y Nos Castle Members Club. However weekends are not available unless it's a very short notice date, by special negotiation. 4. Accomodation for guests is optional but discounts apply to longer B&B stays. If you wish to stay overnight, or are a regular visitor to the Castle, and / or if you wish to use the Conservatory as above, consider joining the Members Club. Non-Members pay £150/ double for one night's B&B at weekends (based on 2 sharing an en-suite) and £140 on Weekdays, with 50% off on the second and each subsequent night of a longer B&B stay. However a 50% B&B discount on the first and every night applies to Castle Club Members, who may also book up to three double rooms at this rate for up to 6 Guests. 5. 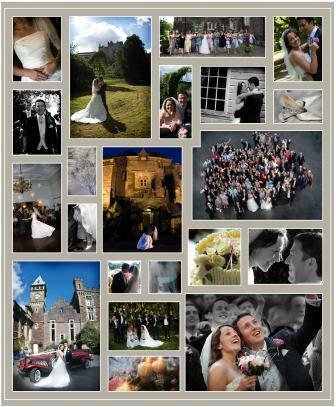 To Book your Wedding Anniversary Party - we suggest you first come to a viewing. Then if you wish to book a date, we will require an initial non-refundable deposit of £1,000.00, with the full balance payable one week before the Event. 6. If you did not marry at the Castle, join the Members Club for free exclusive use of the Conservatory. You pay £30 PCM to build up your Members Balance which you then use for discounted B&B, drinks at the Bar, Evening Meals, and for your Wedding Anniversary Party.